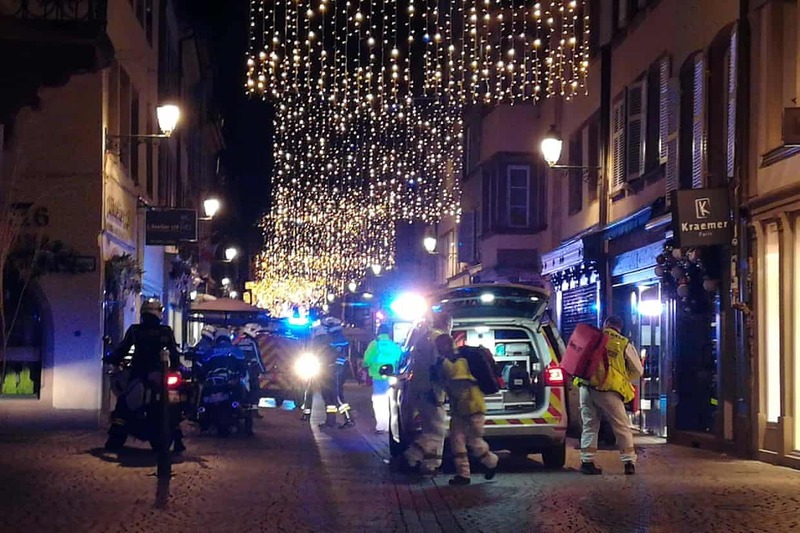 France has upgraded its security threat level as police hunted a gunman who shot three people dead and injured 12 others in a terror attack on Strasbourg’s celebrated Christmas market on Tuesday evening. Six hours after the gunman disappeared after firing at passers-by in the busy city centre, interior minister Christophe Castaner said the government had raised the risk level to the highest category. The move would strengthen border controls and bolster protection of Christmas markets and other events. In a statement, Castaner said the gunman had opened fire in three different places in the city before engaging in firefights with patrolling soldiers. “He fought twice with our security forces,” Castaner said. French media reported the man, who was injured in one of the exchanges, then jumped in a taxi and disappeared. Police immediately cut off major roads in and out of the city and launched a massive operation involving 350 police gendarmes and soldiers, as well as helicopters, to find him. French security services said they had identified the gunman as a 29-year-old born in Strasbourg, known to police and also on the “Fiche S” list of potential security threats. French media reported that gendarmes had attempted to arrest the man for a separate crime at his home in the Neudorf district of southeast Strasbourg earlier on Tuesday. The suspect was not home, but officers reportedly found “grenades” in his apartment. 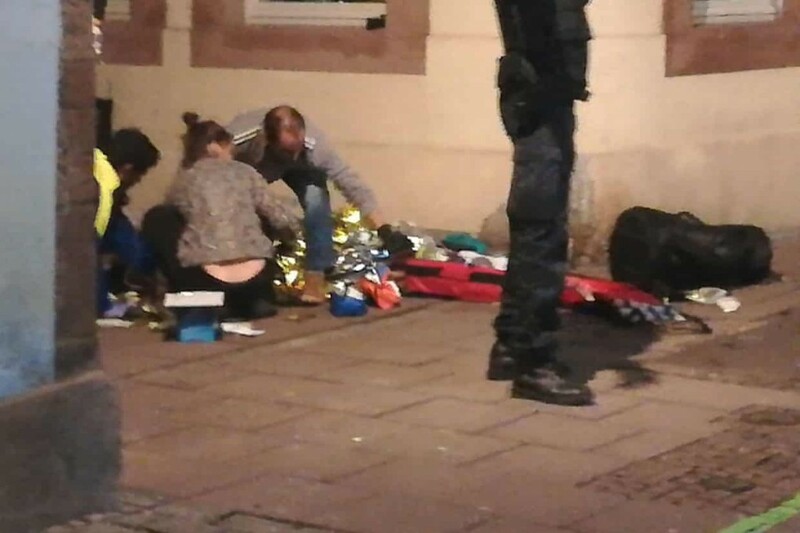 Shortly before 8pm local time, the man, armed with an automatic rifle, walked over one of Strasbourg’s many bridges around the Grand Île toward the Christmas market, which attracts millions of visitors every year. Witnesses said the man fired a first volley of rounds and then walked down the street before opening fire again. Local resident Yoann Bazard said he heard “two or three shots” and screams; when he went to his window he saw people running. “After that I closed the shutters. Then I heard more shots, closer this time. Freelance journalist Camille Belsoeur said he was at a friend’s apartment in the city centre and at first mistook the gunfire for firecrackers. “We opened the window. I saw a soldier firing shots, about 12 to 15 shots,” he said. He said other soldiers yelled for people to stay indoors and shouted “Go home! Go home!” to those outside. One of the dead was said to be a Thai tourist who was shot in the head outside a restaurant. Staff and diners tried to save him but were unsuccessful. Six of the injured were reported to be in a critical condition. The anti-terrorist section of the Paris prosecutor’s office declared the incident to be an act of terrorism and announced an inquiry had been opened into “murder and attempted murder in relation to a criminal enterprise”. The French president, Emmanuel Macron, immediately held a crisis meeting at the interior ministry in Paris. The gunman reportedly shot at soldiers patrolling as part of the nationwide Operation Sentinelle, the French military operation introduced in the aftermath of terrorist attacks in and around Paris in January 2015, and was injured when they fired back. The European Parliament, which is currently sitting in Strasbourg, was put on lockdown, and the parliament’s safety awareness division sent a message to MEPs advising those dining in the city centre to “please stay inside and don’t go out”. “[A] decision has been taken, as a precautionary measure, to close the European Parliament building in Strasbourg. We ask you to stay calm and safe within [European parliament] premises,” it read. Later Antonio Tajani, president of the parliament, said it would not be ‘“intimidated” by terrorism. Several MEPs in city centre restaurants reported hearing gunfire. The Yorkshire and Humber MEP Richard Corbett tweeted that he was dining in the city “where shots (were) fired”. The restaurant was “not letting anyone in or out”, he added. Theresa May said she was “shocked and saddened” by the “terrible” attack in Strasbourg. “My thoughts are with all of those affected and with the French people,” the British prime minister tweeted. The local prefecture tweeted that people should avoid the area near the city’s police headquarters and that all access to the A35 motorway bisecting the city was blocked. Police in Germany said they were strengthening controls at the Franco-German border near Strasbourg. The police force of Baden-Wurttemberg, a state in south-west Germany bordering Strasbourg, tweeted they were taking the extra measures at the border because of the shooting. The transnational tramway between France and Germany was suspended. In the early hours of Wednesday, local prefect Roland Ries announced the Christmas Market would be closed Wednesday and all local cultural events cancelled. France remains on high alert after suffering a wave of attacks commissioned or inspired by Islamic State militants in 2015 and 2016, which killed more than 200 people. Strasbourg’s Christmas Market, which started in 1570, is one of France’s most popular seasonal events. The “Grande Ile” where the market is held is surrounded by water, on one side the main channel of the River Ill and the other by the Canal du Faux-Rempart, is only accessible by bridges. Since the Paris terrorist attacks in 2015, the event has been held under high security. Access to the area is controlled and visitors bags are searched. Vehicles are banned from the area. In 2016, a truck was deliberately driven into the Christmas market in Berlin killing 12 people and injuring 56 others. The perpetrator Anis Amri, a Tunisian who had failed to gain asylum in Germany, was killed four days later in a shootout with police near Milan in Italy. The attack comes during a period of intense tension across France after four weeks of civil unrest by anti-government and anti-president Emmanuel Macron, protesters from the gilets jaunes movement.